Fomer Catholic priest Dale Tacheny talks about the murder of Irene Garza at the Echo Motel February 28, 2014 in Edinburg. 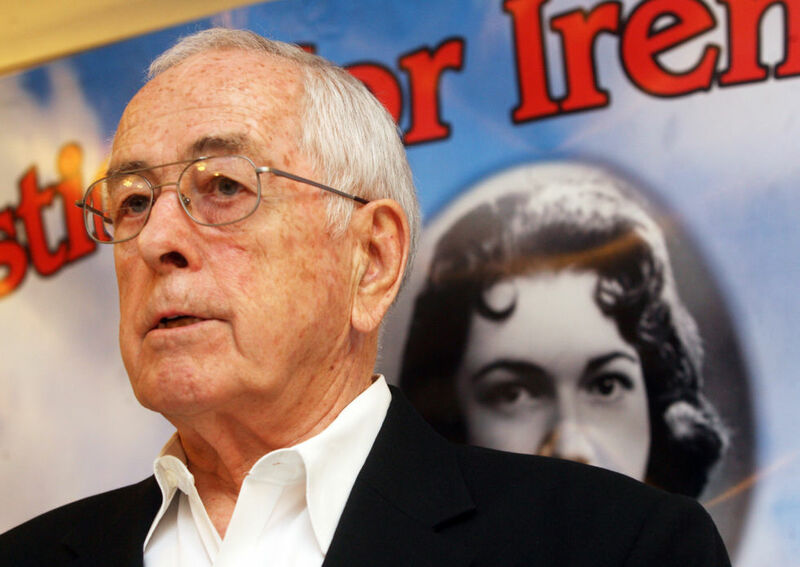 EDINBURG — A former monk who alleges he heard John Feit confess to murdering Irene Garza in 1960 is expected to take the witness stand, according to multiple sources with intimate knowledge of the case but not authorized to speak on the record. The defense had previously tried to prevent Dale Tacheny from speaking to jurors. The former spiritual counselor is arguably the state prosecution’s star witness in its case against Feit, 85, who is accused of murdering Garza after she went to confession at McAllen’s Sacred Heart Church and dumping her body in a nearby canal. The defense argued in its motion, which the court denied, that Tacheny’s communication with Feit during a 1963 counseling session at a Trappist monastery was privileged communication, and thus not admissible as evidence. The law recognizes certain communications as privileged — such as between attorneys and their clients — and not subject to disclosure, and that ecclesiastical privilege is a rule forbidding the admission of communications between clergy and members of their congregation. The state, however, argued that because the confession came during counseling sessions, and not in a clergy-to-congregation capacity, it should be allowed to be entered as evidence. The court agreed. The defense was attempting to block testimony purportedly related to his claim that Feit confessed in 1963 to suffocating a young woman in her 20s in South Texas. It was during that same year that Tacheny — who went by the religious name Father M. Emmanuel — was tasked with counseling Feit while serving as a monk-priest at Our Lady of Assumption, a Trappist monastery in Ava, Missouri. Tacheny, who is not expected to testify until at least the second week of the trial, claims Feit’s confession came during those counseling sessions. Feit moved to the Missouri monastery shortly after pleading no contest to an aggravated assault charge in 1962, which stemmed from an incident at an Edinburg church two years earlier and a month before Garza’s death. The assault in question occurred in March 1960 and involved Maria America Guerra, a 19-year-old Pan American College student who was attacked from behind as she knelt praying the rosary at Sacred Heart Church in Edinburg, where Feit was a visiting priest, according to court records. In other developments, sources say the judge has agreed with the defense to suppress the statements Feit made to investigators after his Feb. 9, 2016, arrest.